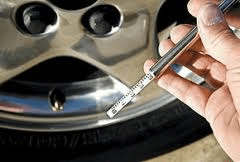 Tire Care – Vermont Tire & Service Inc. The “right amount” of inflation for your tires is specified by the vehicle manufacturer. You will find it on the sticker located on the inside of your driver’s front door. A sample of the sticker is shown below where the tire pressures are highlighted in yellow. Note that your front and rear tires may have different pressures; check the information carefully for your specific vehicle. • Check inflation pressure at least once a month and before long trips. • Remember to check the spare too! • Visually inspect the tires to make sure there are no nails or other objects embedded that could poke a hole in the tire and cause an air leak. Also, check the sidewalls to make sure there are no gouges, cuts, bulges or other irregularities. • Tire inflation pressure changes 1-2 pounds for every 10 degrees of temperature change, increasing in warm weather and decreasing in cold weather. Vermont state inspection law mandates that tires must be replaced when the tread is wo rn down to 2/32 of an inch. Traction, particularly in bad weather, and resistance to hydroplaning is reduced as tires wear. Use this easy “Penny Test” to measure your tread depth: Place a penny between the treads with Lincoln’s head upside down. If part of Lincoln’s head is covered, you have more than 2/32″ of tread depth remaining. In this example, the tire on the left is good and the tire on the right needs to be replaced. Just remember, legal and safe aren’t the same thing. Minimum for safety in the rain is 4/32nds and minimum for snow is 6/32nds.